A belated post thanks to a malevolent little bug which effectively felled me this last week. 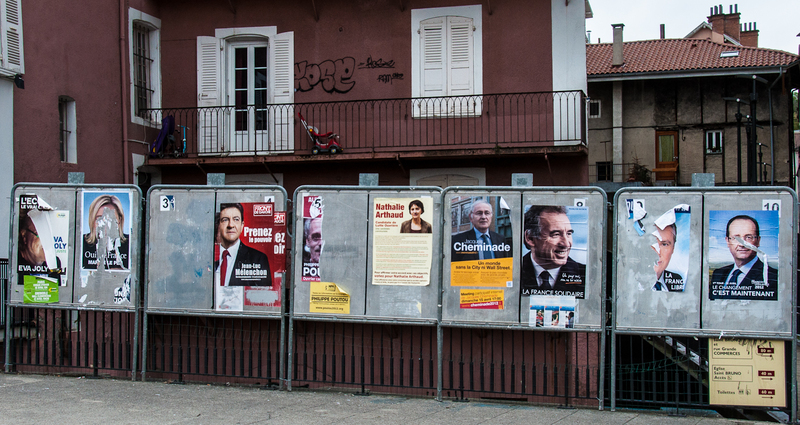 We ended up in France on the weekend of the first round of elections for our ‘maiden’ twinning trip… The embargo on exit poll & early results until 8pm doesn’t actually preclude speculation (as here), it just changes the nature of it. Always interesting to compare the processes. The internet was a constant companion to the TV as our hosts watched the events unfolding, and it was slightly hypnotic, tracking the narrowing gap between the two main players. Having been ill this week I have failed to follow the details of the sinuous dance since, as the two sway to and fro to attract the various votes and the unsuccessful candidates line up or play hard to get, swerving coquettishly… The music plays on. This entry was posted in People, Philosophical, Random, Travel and tagged election, France, photo, politics. Bookmark the permalink.